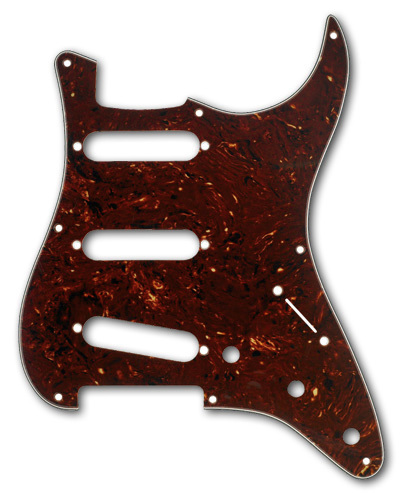 Genuine Fender® '57 vintage Stratocaster® tortoise shell, 4 Ply, 8 Hole pickguard for three single coil pickups. Fits '57 American vintage, SRV and Eric Clapton Stratocasters (USA) '50s Stratocaster® (Mexico). Accepts Phillips oval head pickup and selector switch mounting screws. All tortoise shell pickguards are subject to warping and shrinkage and these we get from Fender are warped, it is a characteristic of the celluloid and vinyl layering. Here is a link to an informative article provided by Fender all about the Tortoise Shell material. Tortoise shell is prone to pitting scattered across the entire surface, this is a characteristic we have seen for as long as we've worked with Tortoise shell and is not something we consider as defect since it is found on every Tortoise shell pickguard we receive from Fender.